Choosing the perfect railing to match your outdoors space and your lifestyle can seem daunting. For undeniable strength combined with timeless elegance, look no further than Fortress’ FE26 Railing. Fortress Railing took away the headache of installing railing and created a the FE26 Panel Railing System. 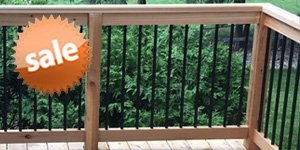 Backed by a 15 year warranty, this railing system is made to withstand the elements, and enhance your deck with elegance and stability. The FE26 Railing System is available in three custom finishes: Gloss Black, pitted Antique Bronze and textured Black Sand. This system comes in pre-welded panels that are twice as strong as aluminum to provide security and style in one, complete, uncomplicated set. Once you’ve selected your finish and determined the dimensions of your deck, planning your project can be done in three simple steps. Fortress commits to providing railing that is known for its beauty and its reliability. They hold themselves to a higher standard than other companies. In order to help transform your outdoor space, Fortress guarantees all of their products meet the Fortress Five criteria: Quality, Strength, Innovation, Versatility, and Ease of Installation. Step 1: Decide the post size that works best for your space. 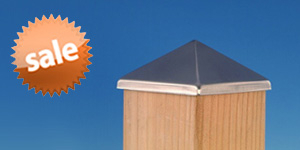 FE26 posts are available in either 2” x 2” or 3” x 3” dimensions. Posts with pre-installed brackets at the standard levels of 36" and 42" are also offered to make installation even quicker. These posts will all be affixed to the surface and substructure of your deck with through the welded baseplate. Step 2: Establish how many panels you will need. The level FE26 panels come in 6', 8', and 10' lengths while the Adjustable Stair panels are offered in 6' and 8' lengths. Panels may be cut or trimmed as needed, however you must be sure to coat any cut ends with Fortress Touch Up Paint to keep them protected. Step 3: Select the hardware you’ll use to attach your components. 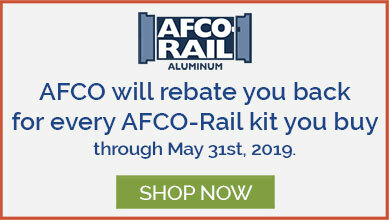 The Universal Rail bracket secures the panels to the posts for a strong and simple connection. If you have angled runs or stairways, the FE26 angle adapter is perfect for any angle from 0 to 45 degrees. All Fortress brackets and adapters are sold in 4 packs to accompany each section of railing between posts. Fortress FE26 is in stock and ready to ship from our DecksDirect warehouse in Minneapolis. At any point in your project, even if you have just a few simple questions, feel free to give our experts a call at 1-888-824-5316 or send us an email at hello@decksdirect.com.